Flora: Callitriche stagnalis, Marsilea hirsuta, Hemianthus callitrichoides, Echinodorus tennellus “Blood”, Eleocharis minima, Eleocharis sp. “Japan”, Staurogyne repens, Limnophila sp. 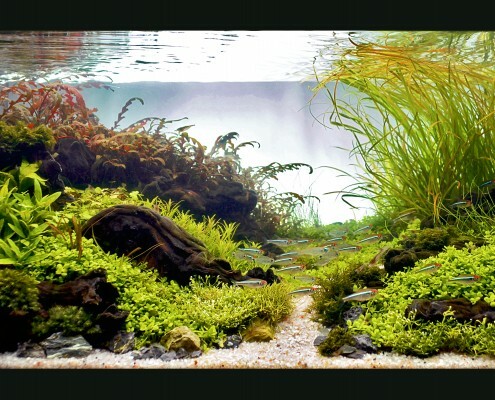 “Vietnam”, Riccia fluitans, Riccardia chamedryfolia, Fontinalis antipyretica, Fissidens fontanus, Microsorum pteropus “Mini”, Hydrocotyle tripartita, Hygrophila pinnatifida e Vallisneria nana. Fauna: Hyphessobrycon herbertaxelrodi, Hyphessobrycon elachys, Poropanchax normani e Neocaridina heteropoda “Red Cherry”.